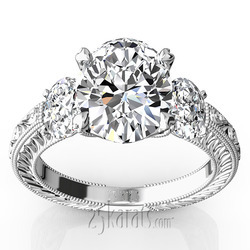 A gorgeous engraved three stone ring to sparkle your proposal! 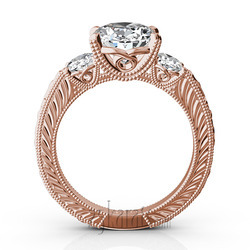 Elegant engraving adds an antique feel to this beautiful engagement ring. 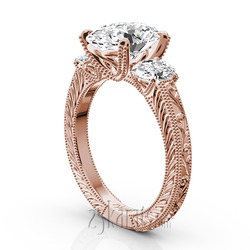 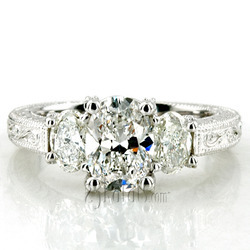 Two side-settings are wire work basket and complete with oval diamonds 0.35ct each. This betrothal ring is available in 14k gold, 18k gold, platinum and palladium. 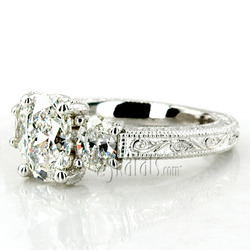 Carat Weight / Size (each): 0.33 ct. / 5.5x3.5 mm.